Over the past 40 years, the genetic predisposition to visual problems has not changed. However, due to society’s sedentary lifestyle, unregulated TV viewing, excessive video game play, and poor computer habits, more and more children are demonstrating visual challenges at home, at school, and at play. This live webcast is designed to help professionals understand common visual problems in children (0-21 years old), what children are “seeing,” why they are seeing it, and how to fix these visual challenges. Combining research-based lecture and interactive labs, this course provides attendees the proper tools to identify and treat visual neglect, cross dominance, eye teaming, visual processing, and scotopic sensitivity. Correcting these issues ultimately improves the child’s quality of life, as reading, handwriting, and playing are enhanced. Grounded in evidence-based information, this seminar offers comprehensive coverage of established techniques that can be implemented immediately and effectively in therapy, at home, and in the classroom. Recognize the anatomy of the visual system in relation to the motor and auditory systems and how they work together to affect and rehabilitate visual issues. Determine functional movement, reflexes, and righting reactions and the influences on reading, handwriting, and play. Identify quick and easy ways to detect visual challenges in a child through his or her productivity and functional responses in various locations. Implement the treatment for parallel pathway learning by utilizing movement and balance. Discover positioning and its effect on visual processing, focus, eye teaming, and hand-eye speed. 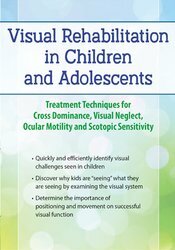 Demonstrate researched based visual rehabilitation techniques for unilateral neglect, visual perceptional challenges, ocular conditions, scotopic sensitivity and cross dominance. Why do we have a dominant eye when half of each eye has control? When should I treat and when should I refer? Scott Berglund, OTR/L, MOT, is a licensed occupational therapist practicing in the state of Wyoming with an emphasis in pediatrics. He is a recognized expert in vision and movement and has been doing rehabilitation in the areas of vision and its relationship to reading for the past 10 years. Over that time, he has taught classes in Dyslexia Rehabilitation and Beyond Dyslexia in multiple settings. He has helped to develop reading rehabilitation programs for clinics in multiple states. Scott is certified in the McInnis Assured Readiness for Learning, the ARL Phonological Awareness Programs and the original Rosner Auditory Program. His research looks into the connection between the eyes, auditory system and movement and its effect on reading challenges. Financial: Scott Berglund is owner and president of Silver Linings Therapy Group – CJB Enterprises, LLC. He receives a speaking honorarium from PESI, Inc. Non-financial: Scott Berglund has no relevant non-financial relationship to disclose. Nurses completing these self-study materials will earn 6.2 contact hours. Expires: 12/7/2021. Iowa Nurses: PESI, Inc. is an approved provider by the Iowa Board of Nursing. Provider #: 346. Nurses successfully completing these self-study materials will earn 6.2 self-study contact hours. Florida Occupational Therapists & Occupational Therapy Assistant: PESI, Inc. is an approved provider with the Florida Board of Occupational Therapy. Provider Number 50-399. This self-study course qualifies for 6.2 continuing education credits. NCBPTE approval by virtue of approval by The New York State Education Department, Office of the Professions, State Board for Physical Therapy licensure board or state APTA chapter Approval good through 8/31/2021.